Abstract: This note argues that global imbalances came about as a result of the geoeconomic strategies pursued by major economic powers. Large current account surpluses of major exporting states are necessarily matched by current account deficits of large importers. The balance of payment identity ensures that every current account entry is accompanied by a capital account entry of the opposite sign. Therefore, we may equivalently refer to countries with large current account surpluses as high-savings countries. The reemergence of a liberal international financial order converted the large savings of the major exporting powers into globally mobile capital. The resulting ‘global savings glut’ has led to unsustainable financial booms in states that liberalized their asset markets. An equally valid story can be told that emphasizes the intensifying competition for market share between the major poles, resulting in persistent oversupply in the world’s increasingly integrated markets for tradable goods and services; and the consequent ‘secular stagnation’ in the center of the international economy. However, such a ‘current account’ narrative decouples the dynamics of global production from the ‘Minskian’ dynamic of financial booms and busts that has plagued the international economy since the reemergence of a liberal financial order. We show how sticking to the ‘capital account’ and focussing on the large savings of major economic powers brings both these dynamics closer to the center of the frame of reference. We argue that the prospects for global rebalancing are dim in light of the high-savings strategies of major economic powers. 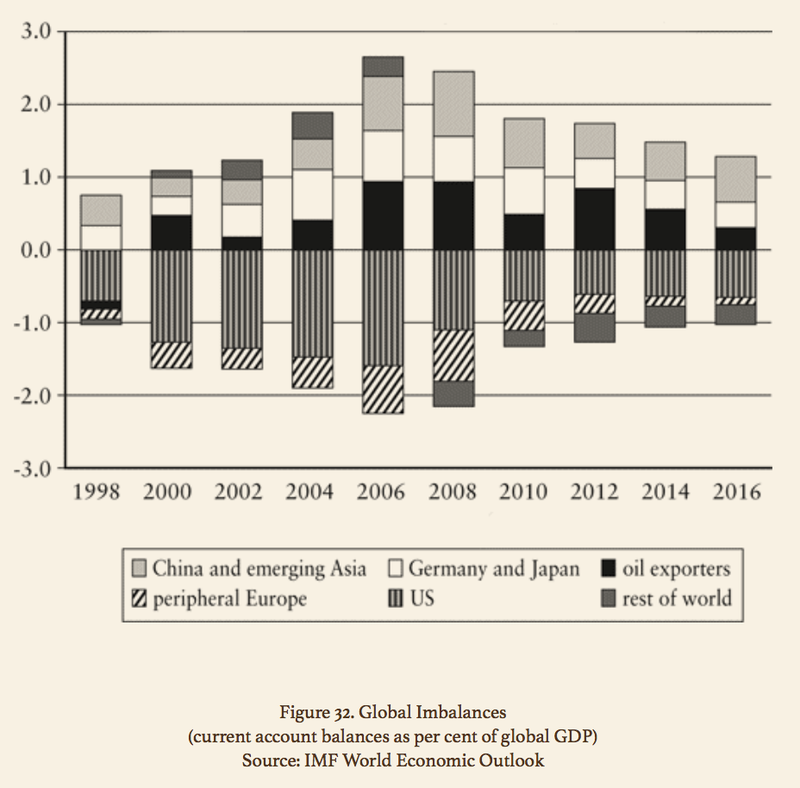 Global imbalances in the early post-war period were characterized first and foremost by the interaction of the geoeconomic policies of three states: Germany, Japan, and the United States. The export-led, high-savings, advanced-industrial strategy followed by the two US protectorates, especially Japan, undermined the profitability of US manufacturing. The consequent stagflation crisis in the core of the world economy undermined the Keynesian consensus and led to the neoliberal counter-revolution, the centerpiece of which was the reconsitution of a liberal financial order. Three essential steps were needed to reestablish a liberal financial order. All three were accomplished under tremendous pressure from unregulated capital flows emanating from the eurodollar market to which US capital had migrated in the fifties and sixties. First, center countries were forced to relinquish policy control over key exchange rates—the UK in 1967, Germany in 1969, and the US in 1971—thus undermining the fixed-exchange rate regime. The second step was the repeal of Regulation Q and the end of financial repression in the US; effected by a panicked Carter administration as the dollar continued to slide in 1980; later consolidated under Reagan. In 1979, Carter also appointed Volcker to the Fed with a mandate to tackle double digit inflation. Volcker sharply raised interest rates, prompting the flow of global savings to the US which sent the dollar sky-high. Japan and Germany continued to follow an export-led, high-savings strategy. During 1945-1979, Japan had largely forced its high-savings towards increasing the productivity of domestic advanced manufacturers. With Volcker’s sky-high interest rate, strong-dollar policy after 1979, Japanese savings strained the leash of Japanese financial repression. By 1982, US Treasury officials persuaded the Japanese as well to liberalize their asset markets and pursue domestic credit expansion. Japanese savings promptly began chasing both domestic and US assets. After the American financial panic of 1987, Japan doubled down on a credit expansion at home. This yielded a super-massive asset price bubble in Japan which burst spectacularly in 1989, followed by secular economic stagnation from which Japan has yet to recover. In its aftermath, Japan switched decisively from domestic credit expansion to a strategy of exporting its high savings. The collapse of container and jet freights in the late-sixties, and the later telecommunications revolution, set the stage for the advent of ‘globalized production.’ Japanese firms pioneered the model of unbundling supply chains, mostly to Japan’s junior partners in what became ‘factory Asia.’ These junior partners followed Japan’s export-led, high-savings strategy. During the eighties and even early nineties, countries of the Pacific rim forced their high savings and those of Japan into productivity enhancing investments at home. The nineties witnessed moves towards ending financial repression all over the Pacific rim, leading to a great asset price bubble that burst in 1997. After the Asian financial crisis, Japan’s junior partners also started exporting their savings and accumulating dollar reserves for national economic insurance. The avalanche of savings directed at US assets bid up their prices and pushed the US tech boom into a frothy bubble, which burst spectacularly in 2000. Like Japan, Germany has followed a high-savings strategy since 1945. German productivity growth had more or less kept pace with that of the US and Japan. It is the only major economic power that has never followed a strategy of domestic credit expansion. In the early post-war period, German savings went mostly towards productivity-enhancing investments at home. Later, following the Japanese example, German firms `unbundled’ their supply chains and began exporting their savings to their junior partners across western and northern Europe. Germany’s junior partners also followed Germany’s high-savings strategy to stay competitive in a fast-integrating market. During the mid-nineties, Germany directed its high savings towards reabsorbing East Germany. After the advent of the euro in 1999, Germany and its junior partners began exporting their savings on a very large scale to the European periphery. The roots of the eurozone crisis can be traced to these developments. In the 2000s, China’s emergence as a global economic power changed the polarity of the core of the world economy from a tripolar to a quadripolar structure. China’s rise was closely tied to the ‘second unbundling’ of ‘globalized production’ whereby firms’ supply chains became extended over vast regional networks. Indeed, topological analyses of “global supply chains” reveal vastly closer ties within these three regions than without. Global production remained tripolar with one pole centered on the US but that now included Canada and Mexico; a second centered on Germany that included most of northern and western Europe; a third one, itself bipolar, in Asia centered on China-Japan that included the entire Pacific rim. Global production has continued to reblance towards the third pole at the expense of the first two. This process will likely continue well into the twenty-first century. Note that hitherto the strongest economic powers had been the most advanced manufacturing states. China has emerged as a pole of global production, and joined the top ranks in a ‘Minskian’ sense, without making deep inroads into advanced manufacturing. This is novel and remarkable. China’s sheer size has enabled it to break the mould. The source of the bulk of the ‘global savings glut’ identified by Ben Bernanke in 2005, then, can be located in the geoeconomic strategies pursued by Japan, Germany, and China. These strategies can be seen as a strong form of ‘soft balancing’ against the United States. The glut was exacerbated by (1) the reserve accumulation strategies followed by ‘emerging markets’ and the oil exporters; (2) the relentless rise in inequality everywhere, especially the US; and (3) by the fact that US non-financial firms themselves became net suppliers of savings. How could the United States deal with the strategies pursued by the other three? US policymakers had only three alternatives strategies available. None of them were particularly appetizing: (i) the US could give up on the liberal global financial order it had helped forge, and reintroduce financial repression; (ii) it could accept the recession effectively being exported by the other economic powers; or (iii) it could pursue credit expansion at home. Given the strong commitment to a liberal financial order among American elites, (i) was simply not on the table. The Fed’s mandate and the domestic political concerns of elected officials ruled (ii) out. The resort to (iii) was therefore inevitable. US policymakers bet on the ability of America’s deep asset markets to absorb the savings emanating from the others. The United States became the importer of capital par excellence. The asset price boom of the mid-2000s in the US and other importers of these savings was the consequence. The implosion at the heart of global financial system in 2007-2008 did not lead to a fundamental change in the strategies pursued by major powers. China, Japan, and Germany continued their high-savings strategy. Japan and Germany have doubled down on exporting their savings. Nor did the United States change course. The Fed has resorted to extraordinary measures to shore up asset prices; looking to the attendant ‘wealth effect’ to cure the ‘balance sheet recession.’ China has redirected more of its savings towards home. It now seems to be pursing the strategy of domestic credit expansion that Japan followed in the eighties. The level of private credit in China is now approaching that of the United States. No wonder than both the US and China are now witnessing unsustainable financial booms. This has created the spectre of a third round of global financial crises that began in 2007; this time centered on China. The root cause of the global imbalances are the high-savings strategies pursued by China, Japan, and Germany. Unless these states pursue alternate strategies to secure their economic interests there is no hope for resolving global imbalances. Note that, for the first time since 1945, we have a pole in the core of the global economy that is not a US protectorate. Alongside the emergence of other, lesser players whose combined heft is nevertheless significant, China’s rise cannot fail to make global accords more difficult to achieve. Specifically, it is hard to see how a version of the Plaza Accord of 1985 and the ‘reverse Plaza Accord’ of 1995 that served to somewhat mitigate global imbalances in the tripolar era, can be achieved now. The G20 is a significantly less effective forum for global geoeconomic bargaining that the now defunct G7. The United States could somewhat arm-twist Germany and Japan in the late twentieth century. Arm-twisting China, Japan, and Germany is going to prove considerably more difficult in the early twenty-first century. Global imbalances will continue as long as the high-savings strategies of China, Japan, and Germany remain in place. As long as these states pursue these strategies, the ‘global savings glut’ will ensure that financial booms continue to plague the liberal financial order. Only the location of asset price bubbles will be determined by which states choose to—or are forced to—import these high savings beyond their capacity to absorb them. Given that there is little chance that these states will change their strategies, global policymakers are likely to play whack-a-mole with financial panics for some time to come.